In this series of articles, we’d like to focus on Japanese traditional & seasonal dishes. Today’s topic will be traditional rolled sushi, called “Eho-maki”. According to the old lunar calendar of Japan, February 3rd is the day before the first day of spring. To ward off illness and misfortune, on this day Japanese families scatter roasted soy beans inside their homes and out of every window and door. In Japan, the day is called “Setsubun” which translates as “bean scattering ceremony day”. Traditionally, this is also the day to eat “Eho-maki”. 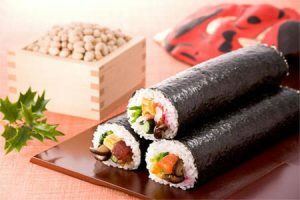 Eho-maki are thick sushi rolls which is believed to bring good fortune if eaten while facing the year’s “Eho” (good luck direction). 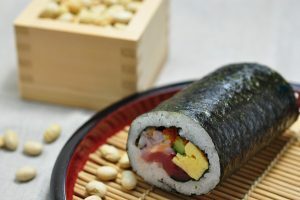 Eho-maki usually have seven ingredients such as cucumber, sweet omelet, shiitake mushroom and eel after the Seven Deities of Good Luck, and on average, Eho-maki are about 8-10 cm long. While you eat Eho-maki, you must be silent. 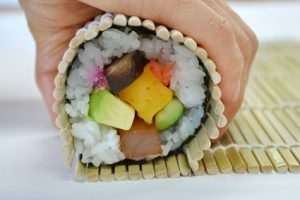 Eho-maki are also called “Maru-kaburi-sushi” (swallowing sushi) because of the traditional way to eat it: make a wish, close your eyes and eat the roll uncut, all while facing the Eho. This is because the eating of Eho-maki without cutting reflects the idea of forming good relationships. 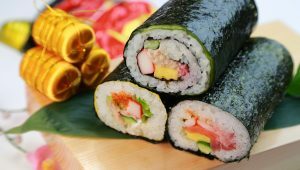 The custom of Eho-maki has spread rapidly in Japan since 2003, when supermarkets and convenience stores began heavily advertising the event. 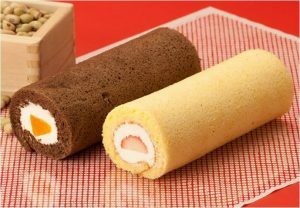 The funny thing is for those who do not enjoy eating Eho-maki, the stores sell other options like roll cakes! Also, Eho-maki are popular not only because of tradition but also because they make mothers’ meal preparation easier. Japan has many seasonal foods and traditional Japanese sweets. As Japan’s leading culinary school in Tokyo, we are open for anyone who’s interested in Japanese Dishes. Please check our menu and class schedule below, and please feel free to contact us for your inquiry!